Charging the Earth - Solar! 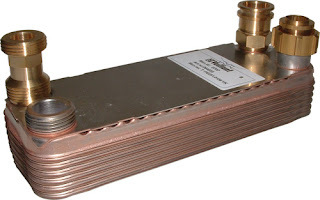 : Why use a Heat Exchanger? 1 June 2012: Someone from Texas replied to one of my postings about the Heat Exchanger. I thought I could summarise here why I installed one for the Evacuated Tubes. The tubes circuit was installed without one at first, but we found it to be too intermittent. It would come on, work for a minute, then go off. • First is a time delay, allowing the block to warm up with one circuit while the other waits until it is ready to download the energy. The delay is such that when the download occurs, there's time for the warmed liquid to make it down to the borehole. Without the H/X, the Tubes are dowsed with cold liquid, reduce their temperature, and stop the pump. The liquid is only moved about 5 metres down the pipe because we have 28mm and 40mm piping to the borehole - so the direct connection has no beneficial effect on the borehole temperature. With the H/X installed, the two circuits get into a steady state, where the tubes can operate at about 21-23ºC, and the ground loop at about 12-14ºC, without stopping the pump. • Two, It also allows the two circuits to operate at a different pressures. When the tubes are operating well, the pressure in their circuit increases and the circulating pump is more efficient. • Sorry.... I have thought of a third! We could have had a water tank. But I don't want to bring mains pressure water up to the loft, we don't have a need for the hot water (that is below), I don't want to have to use up so much copper and a large volume of space and a heavy weight. What else? A solid block of metal cannot freeze, boil, evaporate, get algae, get legionnaires, leak or burst! Liquid to liquid heat exchange is completely efficient in a solid block of conductive metal, if the outer case of the exchanger is well insulated - almost all the joules get across. The operating temperature is only between 20-23º and 5-6ºC, so incidental heat loss through the insulation to the air in the loft is minor risk. Inside the block is a complex set of pathways for the liquids to go past each other, ensuring good transfer without mixing. One requirement is that if one circuit is entering north and exiting south, the other has to go in the opposite direction, south to north. This has been a learning process - I had never seen or experienced the use of a professional heat exchanger before, although I had planned something like that, for self building - using the PCM balls back in autumn 2009. Even for this recent installation, I had planned something like a sandbox with an interweaving of copper pipes, until someone (Jason) pointed out that such things were available commercially. Turns out that our department has shelves of them, of different sizes, for different PhD experiments - and there are many in use in our labs, objects which I had not previously recognised the importance of!